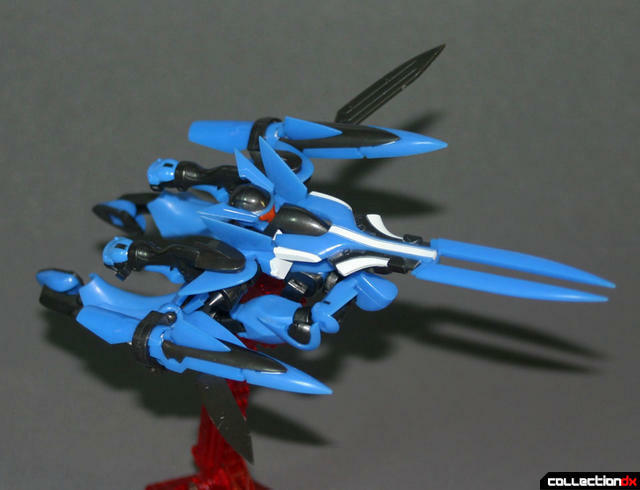 Home » $ » GNX-Y903VW Brave "Commander Test Type"
GNX-Y903VW Brave "Commander Test Type"
Sample provided by HobbyLink Japan! 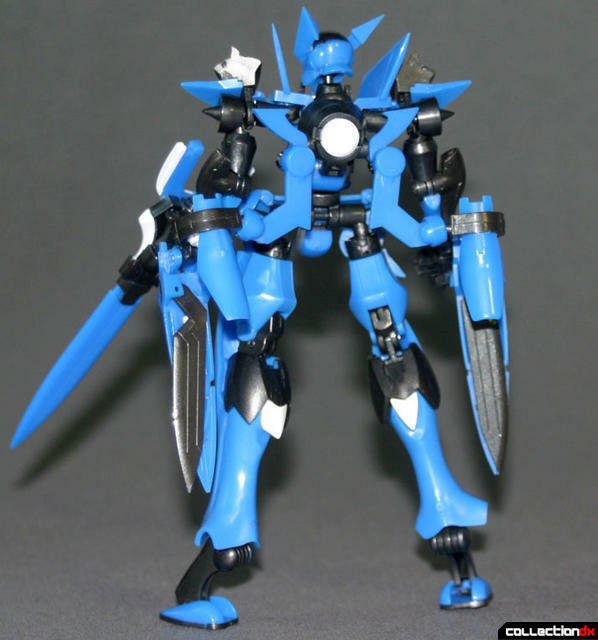 The GNX-903 “Brave” is the successor model of transformable Mobile Suits developed after incorporating the refined pseudo-GN Drive technology taken from the Gundams in the Anno Domini series. Unlike the mass produced GN-X series, the Braves are a limited production of five “Standard Test Types” developed from the SVMS-01 Union Flag and AEU-09 AEU Enact. The single GNX-903VW “Commander Test Type” is derived from the SVMS-01O OverFlag and custom built GNX-Y901TW Susanowo piloted by series regular Graham Aker, the leader of the newly formed Sol-Braves Squadron. 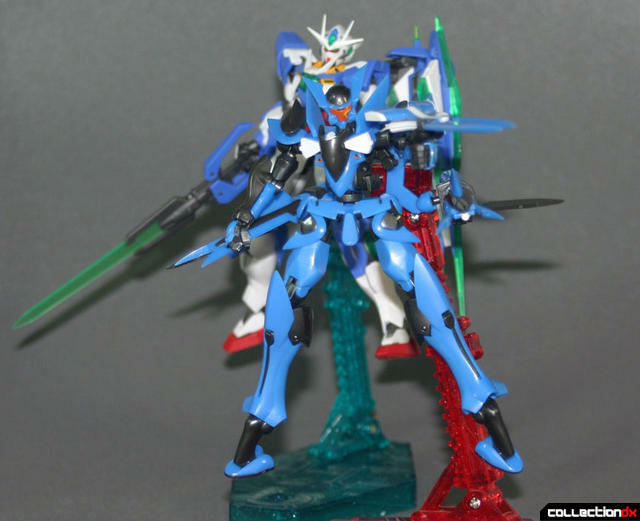 Both the Standard Type and Brave Commander Test Types made their debut in the theatrical conclusion to the Anno Domini series, Gundam 00 –Awakening of the Trailblazer- in a stellar display of aerial dogfight acrobatics fighting against the aggressing ELS (extraterrestrial living-metal shapeshifters) in the final battle for humanity’s future in space. 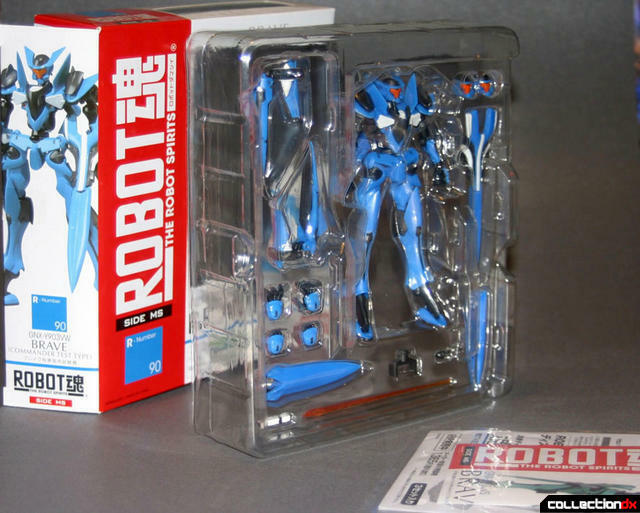 The Brave Commander Test Type was released as Side MS-90 for Bandai’s Robot Spirits’ Gundam line while the Standard Test Type has been produced as an exclusive to the Bandai Collector’s Shop. The Brave comes packaged in the typical Robot Spirits fashion where the logo shrouds the full contents of the tray. Out of the box, the Brave needs to have its binders attached to the rods on its back. Once completed, the figure stands at a nimble 5 ½ inches tall from head to hoof. 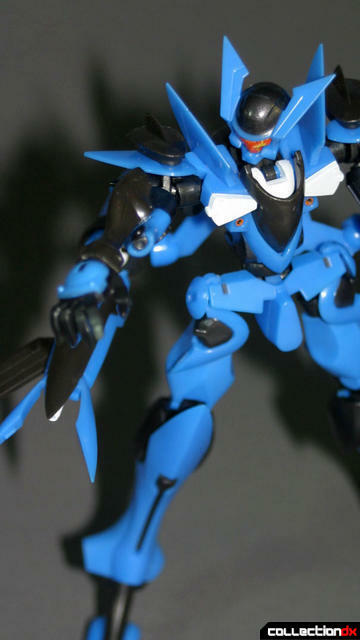 The figure’s articulation is good in most places but due to its shoulder design, the arm has a very limited range of movement compared to its legs. Despite the design, the Brave’s hoof shaped foot is capable of holding the weight of the figure in its MS mode pretty well. 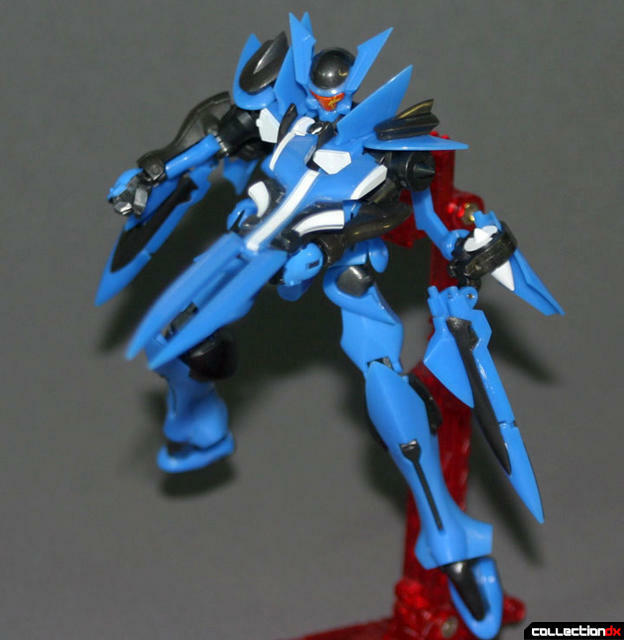 When I first came across 00, the ‘pixie-thin’ design of the Enact bothered me. 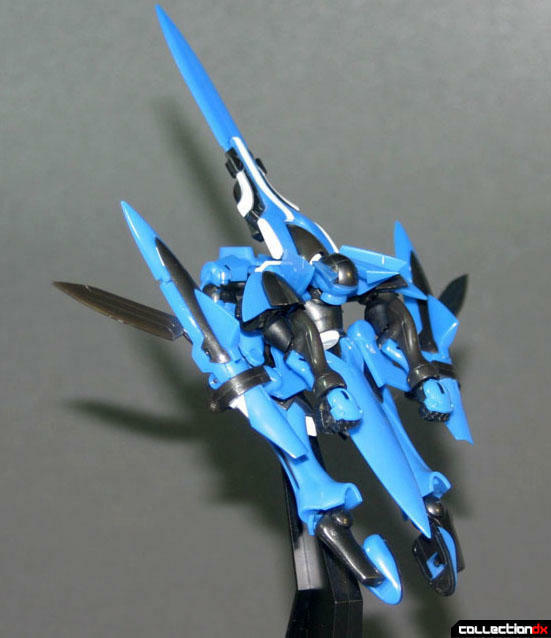 As the series progressed I became a fan of unique shaped suits such as the Flag and its successor Masurao. It’s that same uniqueness that the Brave has quickly become one of my favorite designs from 00 and this Robot Spirits figure fortifies its standing as one of my all time favorites Mobile Suits behind the GP-01 and Astray Red Frame. Compared to its 1/144 scale High Grade model kit, the Robot Spirits Brave Commander Test Type has more moving parts and features. 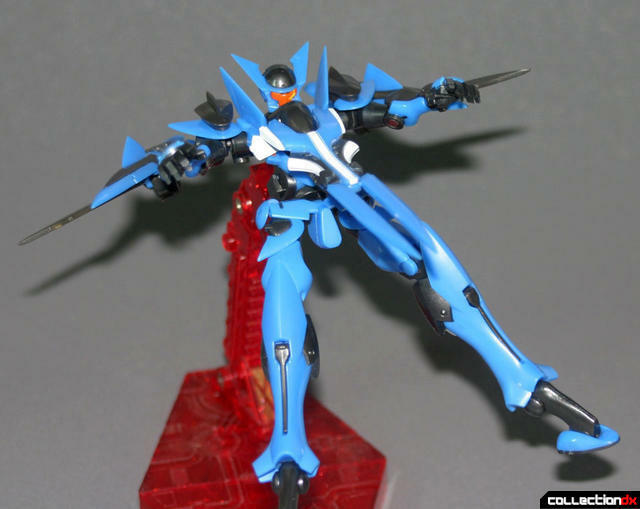 The legs now feature an extendable knee to improve its articulation and the forearms also sport a pair of beam cannons that are revealed by simply bending the arm at the elbow. 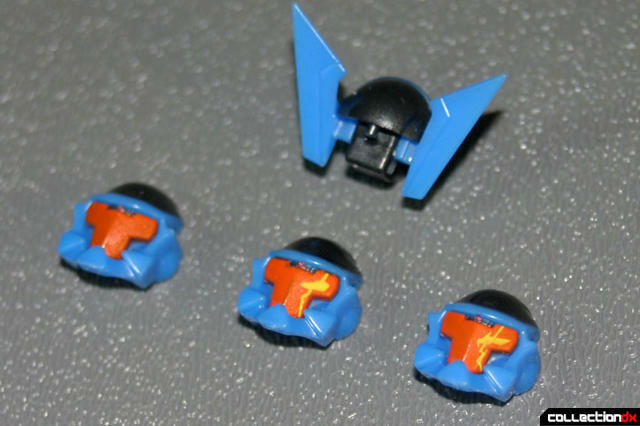 The binders for the Brave’s flight mode have opening tips that reveal an extra pair of beam cannons. 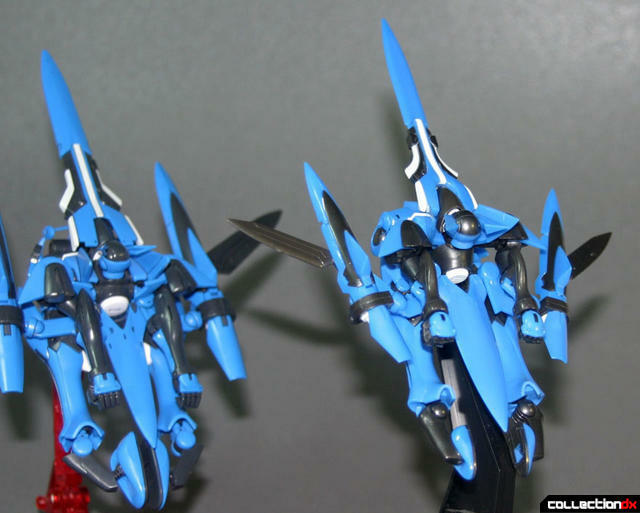 The figure also features additional flight stabilizers that fold out of the legs and give more play value into its fighter mode. 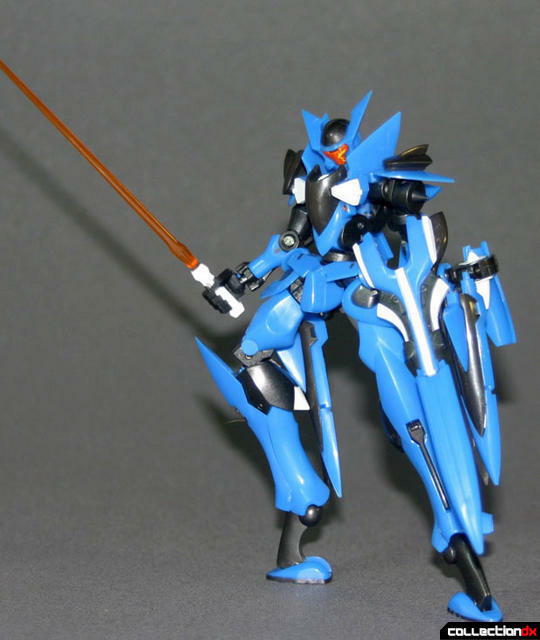 With so much built into this figure, I only wish Bandai would commit to a Master Grade model kit. The Brave’s signature feature is its ability to transform into a fighter mode. Much like the Flag before it, the Brave’s transformation bends the robot in half with the waist bent forward as the arms and legs are stretched back. Transforming the Robot Spirits Brave is the only time that part-swapping becomes necessary and this is the only part of the figure I find really troubling. 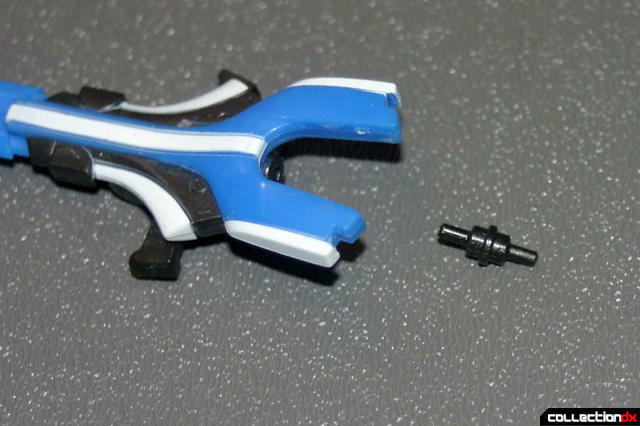 The figure uses a small peg piece for connecting the Brave’s beam rifle to its docking point in the chest. I find this annoying since such a small piece factors heavily into the figure’s longevity. Lose this peg and you’re forced to either live without the fighter mode or find alternative methods. Might I suggest a toothpick? When the process is done, the Brave has a very sleek look appropriate for something designed for flying in space. While it lacks the vehicular aesthetics of a Transformer or a Valkyrie, the Brave’s fighter mode is a satisfying succession to the Flag. 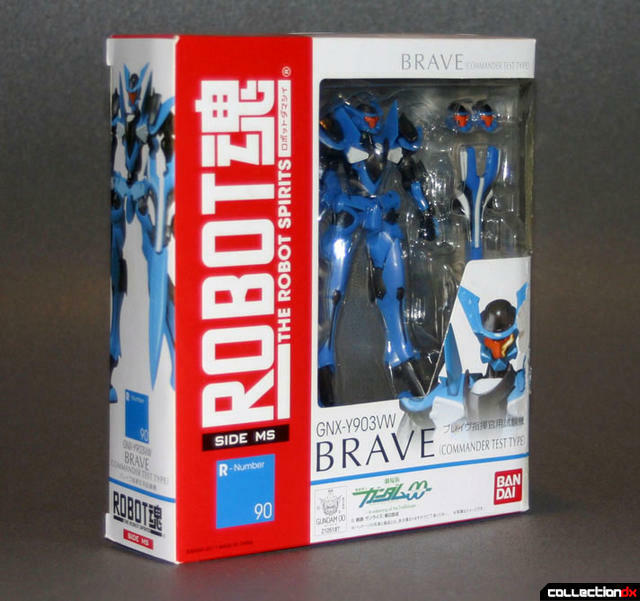 The Brave comes packaged with a mounting bracket to attach it to a display stand that is also compatible with Bandai’s model kit Action Base variety. 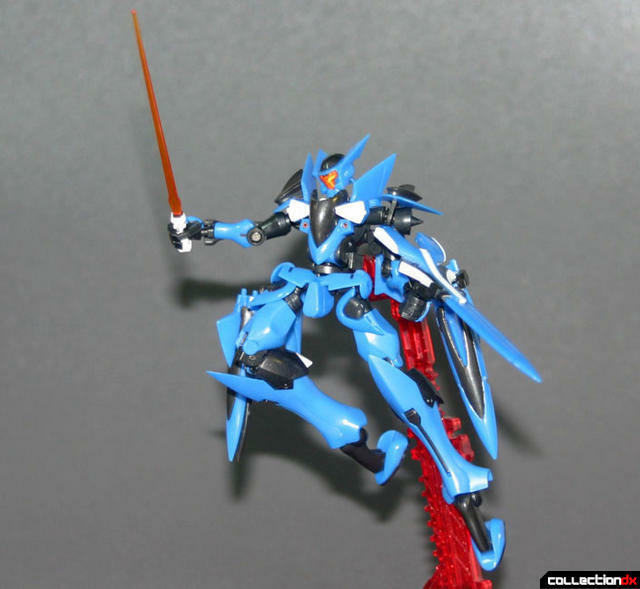 The clip mounts onto the figure’s back rather than its waist and holds the Brave in either its Mobile Suit or fighter mode. 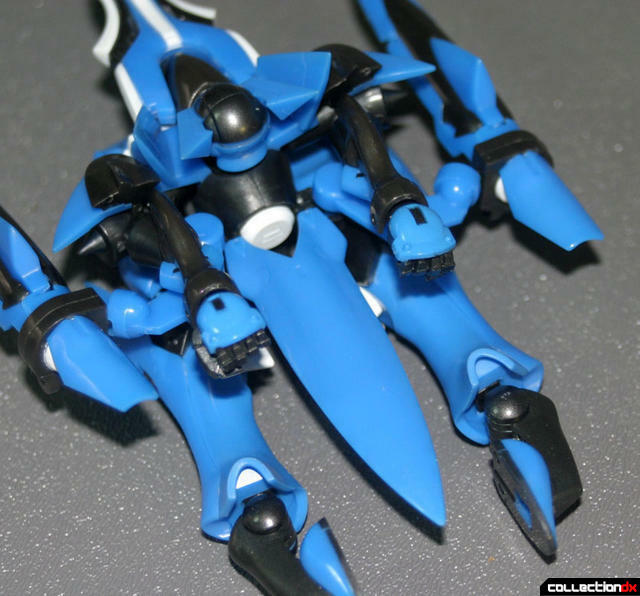 The Brave’s range of accessories comes as standard with a beam saber and the usual sets of hands molded into closed fists, open palm and the dedicated weapon-holding hands, but the Brave pulls its own unique card with the inclusion of different faces. The visor ‘face’ of the Brave can be removed and swapped for two alternates showcasing the Suit’s glowing sensor eye in either the clean edged ‘lit-up’ or sharp ‘glaring’ look like in the animation sequences from the series and film. The Brave’s beam rifle is designed to split in half at the tip and the figure comes with two interchangeable parts that simply peg into the front of the rifle for its closed nosecone form and open firing mode. The final piece of the package is the GN Particle Container, an accessory of the fighter mode for long distance flight. The container acts as an extension to the fuselage and attaches onto the Brave’s back. When attached, the Container gives the Brave a much sleeker look and the appearance of a more complete aircraft. Overall, I really like this design and the figure was no exception. 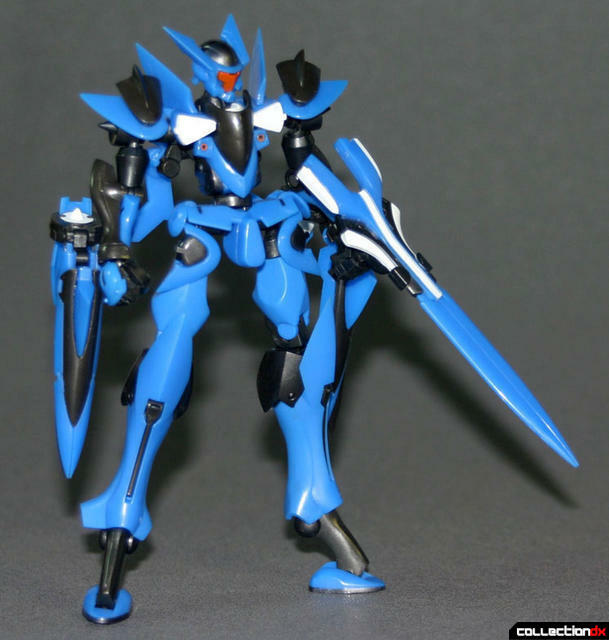 Its shortcoming in articulation and delicate parts design notwithstanding, this is a solid entry into the Robot Spirits line. As a fan of the Flag generation, it is no question that the Brave “Commander Test Type” is a fun piece and a great addition to the “Non-Valkyrie” variety of transformable mecha.